Spring is NOT merely reserved for a week-long break at the beach, planting flowers, pulling out those white jeans and open-toes shoes, the return of pollen and the age-old practice of the big “Spring Clean.” Spring is a time of renewal – making it an excellent time to reimagine key areas of your home, whether for your own enjoyment or to increase its value and appeal to a potential buyer in the near future… or BOTH! According to Remodeling Magazine’s Cost vs. Value Report for 2018, a bathroom remodel and/or addition still brings a great return on investment. In addition to enjoying a newly revamped space in which to start and end each day, you can expect to recoup some of the money invested when it comes time to sell. If executed properly with lots of WOW factor, your bathroom remodel could serve as one of the major reasons a homebuyer may want to purchase your home. The Cost vs. Value Reports suggests that a midrange bathroom remodel costing about $19,134 can expect to see a return on investment of right around 70% or $13,422, whereas an upscale bathroom remodel costing about $61.662 can expect to see a return on investment of right around 56.2% or $34,633. In the event that a bathroom addition is required, the margins are a tad closer. A midrange project of $44,717 will likely see 59.9% ROI, and an upscale project of $83,869 will likely see 54.6% ROI. 1) Natural Stone Elements – Granite and marble have long been the star of the show in bathroom counters, but more recently designers are really loving the look of natural elements throughout the bathroom – from the shower surround to the walls to the flooring. Not only are they naturally beautiful, but they’re incredibly durable. 2) Smart Showers and Toilets – From futuristic steam showers with special controls and sensors, to toilets with flushing sensors, heated seats, self-cleaning nozzles, overflow control and smart flush technology for water savings, bathrooms are going more and more high-tech! 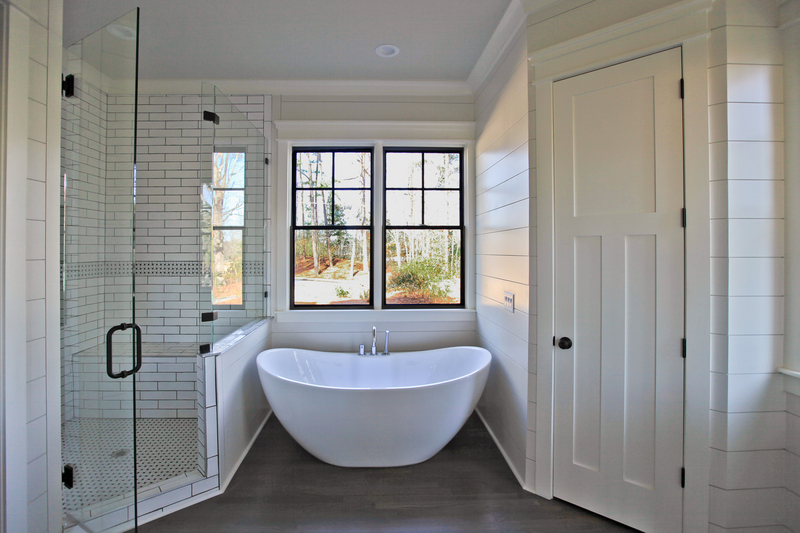 Many homebuyers/renovating homeowners are also starting to incorporate wiring over the tub for a little TV viewing while you soak – the ultimate in relaxation! 3) Barn Doors – Barn doors are NOT just for the barn anymore! Often featuring reclaimed wood (or the suggestions of such), these sliding doors have found their way from the outdoors to the indoors and are quickly becoming a hot commodity in bathroom décor. 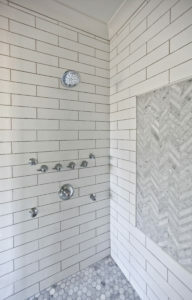 4) Subway Tile – Although subways are not always known for their cleanliness, the resurging trend towards the use of subway tile in bathrooms gives the sense of a sparkling clean space of tranquility. Many designers are adding darker grout which – in addition to helping hide any dirt and grime between cleanings – gives bathrooms an undeniable vintage feel. 5) Sleek and Spa-Inspired – The overall theme for bathrooms these days is uncluttered, utterly refined and absolutely inviting. A blend of textures paired with soothing colors, it’s clear what was intended when the name “rest” room was first uttered. 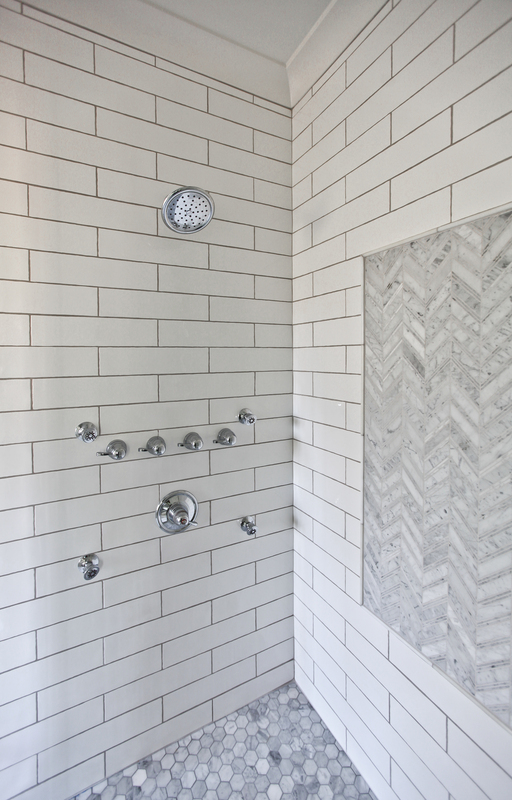 Whether building a custom home from the ground up or renovating your current home, Highlight Homes welcomes the chance to help you incorporate all of the elements outlined above and so much more into your new master bathroom. To learn more about Highlight Homes and take a peek inside our gallery of projects, please visit us at www.highlighthomesga.com. When you’re ready to schedule a no-obligation consultation, reach out to us by phone at 678-873-9234, email us at info@highlighthomesga.com or fill out our online contact form and someone will be in touch with you shortly!